When a customer opens a dispute he/she can also request for a partial or full refund of the order total. 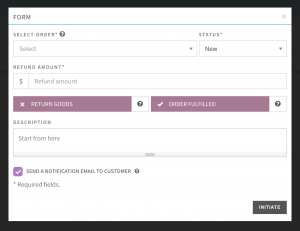 You can also initiate a refund for an order from your admin panel. If you’ve proper permission, you can either approve or decline the refund request in this section. Info! Initiating a refund will now proceed the actual refund to the customer. You still have to send the money by yourself.